Jason Woolley had experienced much success before entering the NHL. After highly impressing with the Michigan State Spartans, the defenseman joined Canada’s National Team and helped his country earn a silver medal at the 1992 Olympic Winter Games. 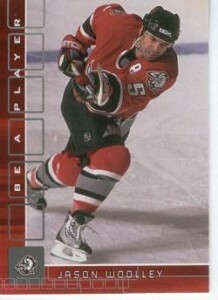 Jason Woolley closed out his NHL career with Detroit. Drafted in 1989 by the Washington Capitals (61st overall), he took part in his first league match in 1992. While it would be his only game with the Capitals that year, Woolley went on to enjoy 13 more seasons in the league establishing himself as an offensive-defenseman. I recently had the privilege to speak with Jason about his hockey career and present business duties. You scored a large number of game-winning goals as a defenseman. Which one would you say was the biggest and most valued? Hands down the biggest goal I ever scored was Game One of the 1999 Stanley Cup Finals (overtime winner) against Dallas. I was “King of the Hill” for a day or two. The interviews were not hard to find, let’s put it that way. Would you mind telling me your personal experience at the 1992 Olympic Games and achieving a silver medal with Canada at such a young age? The Olympics was one of the greatest moments in my career. There is something to be said about representing your country. Winning a silver medal was just a bonus. Being the first Canadian to ever score in an Olympic shoot-out was pretty cool too. The whole experience was special; it was like Grand Central Station. There were guys coming from everywhere to try and make that team and from one day to the next you never know if you were going to be still standing. The leading scorers were being let go all the time. Dave King had a plan and a vision. I am just glad I could be a part of it. Having gone on a few extensive postseason runs, what would you say are the keys to fighting through such a challenging task and schedule? My key to success come playoff time was simple: focus like never before and enjoy the moment one day at a time. I loved the big stage, for some crazy reason I did not feel the pressure. In fact, I was more relaxed than ever on the ice the deeper we went into the playoffs. What would you say was your greatest asset as a defender? Did you view yourself more as an offensive-minded player? I was an offensive-defenseman. I think my greatest assets were the ability to see the ice, precision passing and my forward-like ability in the offensive zone. I was actually most confident when I was in the other teams’ end. I was probably most known for my no-look passing. Your best seasons and playoff performances came with the Buffalo Sabres. What allowed you to flourish so much with that team? I enjoyed being counted on and in Buffalo, my teammates relied on me to bring my A-game every night. I felt I let the team down when I wasn’t at my best and you ask any athletes, to have your teammates depend on you is a very satisfying position to be in. Perhaps best known for his time with the Buffalo Sabres. Is there a player you see in the game today who reminds you a little of yourself in terms of style? I see different facets of my game in other players but I don’t think there is a clone yet. I hate to bring up bad memories, but had Brett Hull’s goal in the 1999 Cup Final been disallowed, do you believe the Sabres could have fought back to win the series? It’s hard to say. Dallas was a very disciplined team but in the playoffs it’s all about momentum and if we had been able to win that one I think we had a shot. I don’t lose any sleep over it to be honest with you. No goal! Was there a teammate who showed you the ropes or served as a role model when you began your NHL career? Unfortunately, I didn’t really have anyone who took me under their wing. I started in Washington with the Capitals. We had a great defense and I learned a lot from them, but no one took me under there wing that’s for sure. Who would you say was the most underrated teammate you ever played with? I would say defenseman Fredrik Olausson. What advice would you give to young defensemen today? Keep it simple, move the puck and then join the play. Get in a few fights here and there to show your a gamer. Being tough is not necessarily fighting; it’s winning battles and playing through pain. Where did the idea for K-nected come from? K-nected was an idea our CMO and Co-Founder Dennis Sarafa and I came up with while we were engaged in a discussion about post-career. He asked me what I was going to do and I said, “I don’t know, what do you have for me?” K-nected’s idea is based on how hard transition is for most professional athletes. I don’t think people realize how difficult it is. All of a sudden one day you can’t make a living doing something you have been doing since you were four-years-old. Tell a doctor at age 40 he can no longer practice medicine. It’s very hard and don’t let anyone tell you any different, their full of it. You are only as strong as your network and K-nected gives you an exclusive place to go online and network amongst the brotherhood (NFL, NBA, MLB and NHL) both socially and professionally. Think Facebook and LinkedIn but for current and former athletes only. Sport is a sprint, life is a marathon: Be k-nected. I read that Shawn Horcoff is a member in the network. What have some of the other athletes enjoyed so much about your site? The K-nected site is a very player-friendly site. After a year and half of getting feedback from players, we have learned many things. 1) Exclusivity is everything. 2) Security and guys feeling safe on the site. 3) Re-connecting with old teammates. 4) Posting photos. Our job is to give guys a reason to keep coming back and hopefully breed opportunities for them. You mentioned that you oversee another business and partner in a third. Could you tell me a little bit about these projects and your involvement? Everything I touch is in the athlete world; it’s where I feel I can be most efficient. I am co-founder of Hat-Trick Productions, a full-service event production company specializing in Fanfests. In two short years, I have produced the Chicago Blackhawks Convention, the World Juniors Fanfest in Ottawa and in 2008 we put the Hockey Canada Fanfest on tour through the Canadian Fairs reaching milestones such as winning best new exhibit at the Calgary Stampede last year. The opportunities are endless and breaking into the hockey world has been very exciting for me. My business partner David Martin launched this Fanfest model in MLB ten years ago. I had to bring it to hockey and the fans. Lastly, I had the opportunity to partner with an icon in motor sports (Alan Miller) and create a little boutique sports agency called “The Players Group”. This business is in its infancy stage, but the chance to work alongside Alan Miller and learn the ins and outs of representation is invaluable. Alan currently represents Jimmy Johnson, Kyle Busch, Danica Patrick, Helio Castroneves and more. Our first client is Jack Johnson of the Los Angeles Kings. Not a bad place to start. Life after hockey seems to be working out very well for you. Success after hockey will come the same way it did in hockey: hard work, determination and doing what you enjoy. It’s important you wake up everyday and face the challenges; time management may be the toughest challenge of them all. I really did not come into my own until I was in the league for five years. I kind of feel it’s going to take me that long in business as well. I could be wrong, time will tell. Bottom line, I am as determined to succeed in business as I was on the ice. What is your favorite part about retirement from hockey? My favorite part about being retired from hockey is coaching my kids and watching them participate in sports. I love spending time with my wife and kids, but at the end of the day I have to go out and battle like I did on the ice to set up phase two of our life and my family. I’d like to thank Jason Woolley very much for taking the time to speak with me and wish him the best of luck in his future plans.